Now that the last wedding cake of 2012 has been delivered (wooooooop! ), I’m thinking about what 2013 has in store. 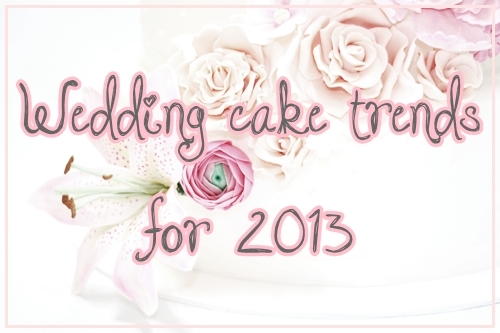 These are my 10 predictions for Wedding Cake Trends 2013 for us in the UK in no particular order. These are taking the wedding world by storm! (I’ve always wanted say that). But seriously, these are very popular, and like quite a few of our trends it started in the US of A. Real or sugar they make bouquets and cakes look eco chic, even if you have no interest in the saving environment what so ever. They aren’t as delicate as normal sugar flowers, so even the heavy handed sugarcrafter should be able to do something that’s vaguely reminiscent of the real thing. Above is one I made earlier, the dusting and shading are what takes an average gumpaste/flowerpaste creation to the next level. Apparently the wedding colour of 2013, if you believe this Pinterest board. There are a loads of things you can do with mint and desserts, mint coloured accents on a cake, peppermint buttercream on a naked chocolate cake. Dribble. If your are sick to death of the vintage weddings, please brace yourself for another year of vintage dresses and cupcakes in china. It wont be so in your face in 2013, so breath a sigh of relief. Not many people really want a traditional Lambeth style royal iced cake for their wedding, but little touches like ivory, lace, and roses inject a bit of vintage into an otherwise modern cake. 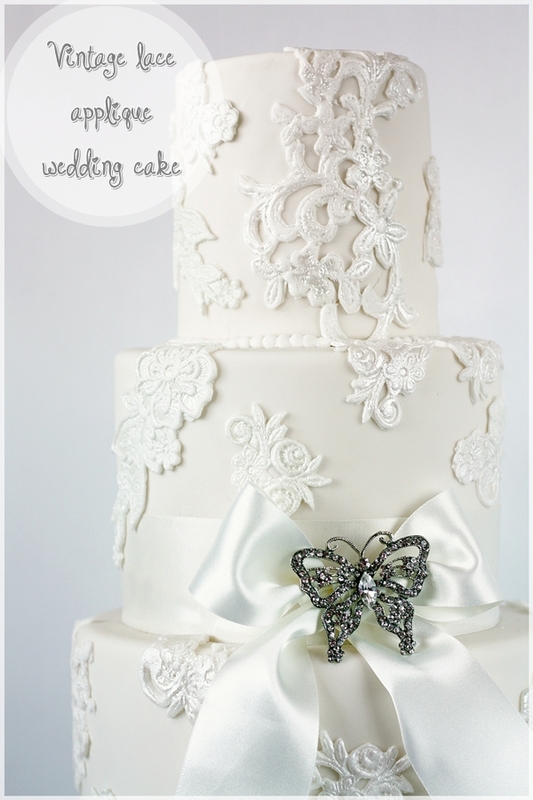 The cake above has vintage stlye lace applique I made using some tricky molds and the freezer. Brushing with lustre dust brings out the detail whilst adding a subtle shine. Viva la vintage! 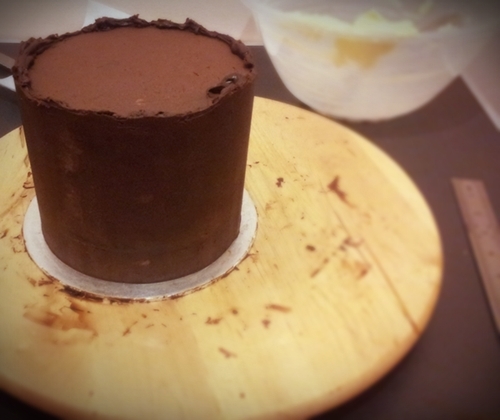 The making of a 6″ cake tier. This is just before the final step of levelling the ganache. Yes that is a metal ruler on the right, its all very scientific you know. Gone are the days of 2 inch cakes, unless we’re talking about Cake Wrecks. Flat and round has made way for tall and sharp wedding cakes. My cakes once iced are a whopping 5 inches, which means you get more for your money (go on my son!) with four layers of cake and 3 of filling. Tall cakes also mean that a small wedding can have a WOW cake without resorting to fake tiers or over the top decoration. Or it could all be because we are greedier. It would be counterproductive to write a paragraph for this. Using icing sheets to print existing patterns or handpainting designs on to a cake means that you can replicate pretty much any fabric or design onto your wedding cake. That means decor, dresses, or sick tablewear can be reflected on your cake as well. Sweet! First it was monkeys, then it was owls, now its the generic love bird. Bird toppers with a top hat and a veil (a teeny weeny bit cringey, maybe?). Too conformist? What about dread-bird for the bride and a tash-bird for the groom? No takers? 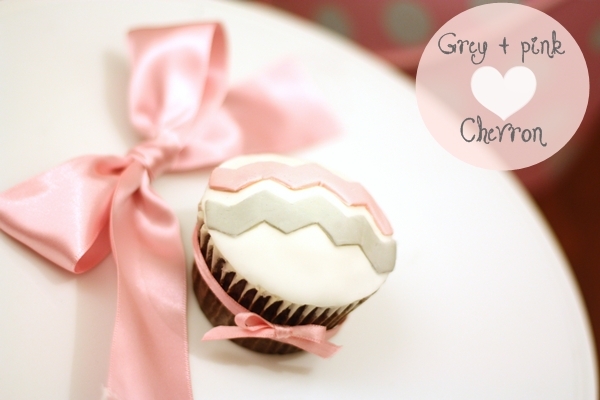 I know I know, the first chevron cakes are soooo circa 2011, but who cares? I’ll still be swooning over them when I’m deep into my old age, like 40 or 45 even! My non-cake friends tell me they are just zig zags, but inside, I know there’s something more. There has to be, ‘cos I cut each strip by hand…And I didn’t do that for nothing. Check out the above photo. I wasn’t going to do another one for you, I’m far too efficient. They’re one of my favourite colour combinations because its ice cool and feminine at the same time. You know, grey = man, pink = woman. What do you mean social constructionism of gender difference? I don’t know what’s ‘bang on trend’ (bleugh) in the wedding flower world but sugarcrafters are always looking to spread their wings to more interesting and challenging flowers. I wouldn’t say Ranunculus are harder than roses, but they seem take an age compared to the tried and tested wedding cake favourite. Peonies are frilly and romantic and can be made with loads of petals, or just 4. 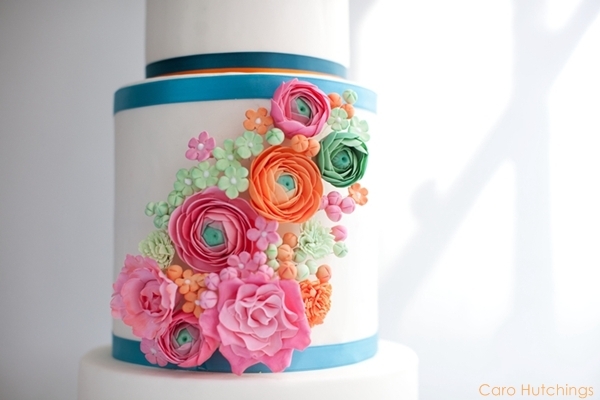 Plus, I’m positive we’ll be seeing some more Ranunculus in the wedding cake mags next year. Wink wink nudge nudge, ey. [Disclaimer: These recommendations are based purely speculative and therefore may or may not come true. I cannot be held responisble for any purchasing of equipment based on my recommendations, which consequenly gather dust amoung the other defunct 114 cutters and tappits still in their packets. I also absolve myself from your crushing disappointment after hearing your July bride wants an ugly steampunk themed cake, or the 76th enquiry for ‘cheap simple wedding cupcakes’. I’m like your blog,the cakes are very beautiful!congratulations. 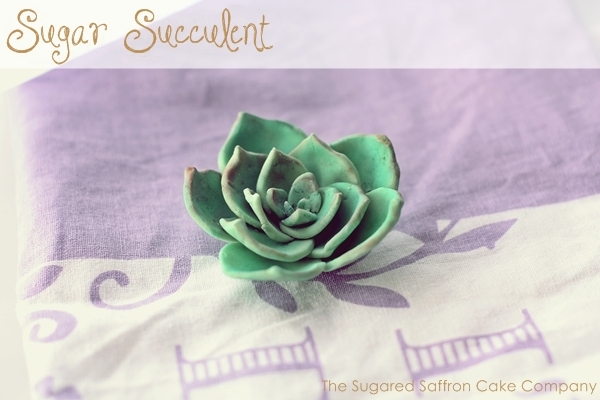 On a serious note though…I’m with you on the succulents. I think that they were big last year on tables…but 2013 will def see them on cakes. I absolutely love the dry humour you bring to your posts. Great predictions and such a beautiful and varied selection of your work. That succulent looks so real!! Your disclaimers mean nothing to me, I’ve already preordered all the equipment needed. On a more seriouse note, I love the prediction. I’d like to see orange & blue make an appearance as a colour combination just once. Maybe I’ll push for it with my next order. Great round up of next years trends, I’m already seeing some of these with my brides for next year.